Soccer is the most popular sport in the world, and has been played in almost every country across many generations. Even though the game of soccer is thought to date all the way back to the 2nd and 3rd century BC, the first soccer shoes or soccer cleats were thought to have originated sometime around the 1500’s. King Henry VIII is credited as having the first pair of soccer cleats and they were likely made by the Shoemaker Cornelius Johnson around 1525. Although these were technically soccer cleats, they differed greatly from the soccer shoes that we have come to know. King Henry’s soccer cleats were ankle high and were made of rigid leather that was much heavier than the material used for making normal shoes of the time. Prior to King Henry VIII’s soccer cleats, players would use their hard, leather work boots that usually had a steel toe-cap. As you can imagine, these were not the ideal shoe to wear for playing soccer! To gain more traction, the players started to hammer metal studs to the bottom of their shoes. 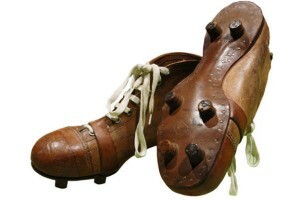 As the game evolved and become more popular in the late 1800’s the demand for better soccer shoes began to increase. It was then that the shift from wearing soccer “boots” to the more traditional “slipper” style happened. Players wanted a soccer shoe that was better designed and more comfortable. As the game began to develop and become more organized rules about what were acceptable soccer cleats did as well. The old metal studs that players pounded into the bottom of their soccer shoes now had to be rounded to prevent injuries. 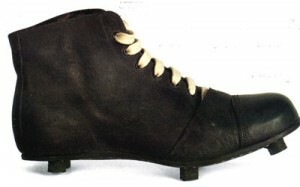 These cleats typically had 6 studs, were made of leather, and had a tendency to become very heavy during rain. These 6 studded, heavy leather cleats remained relatively unchanged the mid 1900’s. Soccer cleat manufacturers such as Gola, Valsport and Hummel began to produce soccer shoes starting in the early 1900’s. Around 1925 the Gebrüder Dassler Schuhfabrik (Dassler Brothers Shoe Factory), led by two German brothers Adolf & Rudolf, produced the first soccer cleats with interchangeable studs. These interchangeable studs allowed players to adjust to different field conditions without having to purchase multiple pairs of cleats. The next big evolution in soccer cleats happened from 1940 – 1960. In the post-World War II era manufacturing became stronger than ever before. Air travel also became much more affordable and more and more international matches began to be played. The increase in international play began to highlight the incredible skill that players all around the world had. Both of these factors influenced the next innovation of soccer shoes. Manufacturers began to producer lighter cleats that allowed players to focus on kicking and controlling the soccer ball on a mass scale. Soccer cleats began to focus on ability to enhance a player’s skill, not just on protective qualities. During the early 1940’s the Dassler Brothers, Adolf & Rudolf, dissolved the Gebrüder Dassler Schuhfabrik shoe company. Adolf formed Adidas out of the original factory, and Rudolf ended up forming Puma a few years later in 1948. 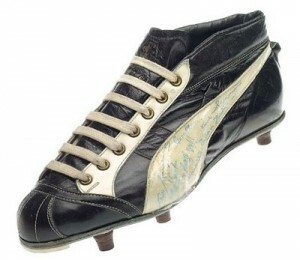 Puma began to produce the Puma Atom, which had the first interchangeable studs that were constructed of plastic or rubber instead of metal. Later in the 1960’s Puma designed a cleat to be worn by the soccer legend, Pelé. The 60’s also gave birth to several other soccer cleat manufacturers including Mitre, Asics and Joma.